I ordered six chairs total and am pleased with their quality. One leg of one chair arrived slightly scarred in an obscure place, but was easily mended and not noticeable afterward. The dark walnut is a true color. The upholstery is a beautiful rich red color with a pleasing texture. Great value for the price! 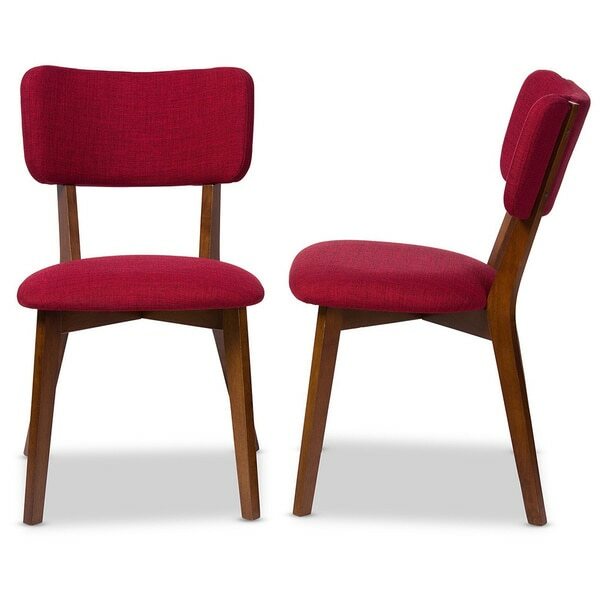 Inspired by the 1950s 'diner' look, but with a modern fabric and colour for a fresh take, the Monaco Mid-century Modern Scandinavian Style Dark Walnut Finish Red Fabric Upholstered 2-Piece Dining Side Chair Set has so much to offer to the decor of your retro modern dining room. These dining chairs pair clean lines with a sleek finish for a contemporary feel. Rounded edges on the seat soften the silhouette, while the angled legs keep the design fresh and modern. Perfect for relaxed dinners, the curved back is shaped to support and is extra comfy for after dinner chit-chat. With a sturdy frame, built-in cushioning and beautifully stitched back to add texture and shape, the Monaco works well as a stand-alone piece or as a part of a full dining set. Made in Malaysia, the Monaco requires assembly. Chairs look great and are very comfortable. The con is the wood chips easily. Nice chairs. Just as pictured.you will need to add pads to the legs or they will scratch your floors. I sit in these chairs several hours a day. Updated: After 6 months, one of the backs on the chairs just snapped in two. We started checking the other chairs and noticed that some of the wood under the seats was cracked. We are not small people but we are not that big. They were Ok while they lasted. Back of one of the chairs snapped after 1 year. Beautiful chairs. Wood wasn't sturdy and broke while sitting on it. Return was easy. Legs broke on 3 of the 4 chairs after only two months. This after receiving one chair with a broken leg in the box. Cheap! Do NOT waste your money. love the color. wanted back and seat upholstered for comfort. "The dimensions you have listed are confusing. I'm doubting the seat is actually 23 inches wide. Please see this listing from another retailer, which states the seat is 18 inches wide. Please clarify. Thanks. *"
This item is confirmed to be approximately 32.7" H x 23.6" W x 19.1" D.
"How wide is the seat?" The seat is approximately 22" inches wide. "Is the fabric stain resistant?" Hello laurend, no, the fabric is not stain resistant. Thank you for shopping with Overstock! "are these chairs stackable? Baxton Studio Monaco Mid-century Scandinavian Style Dark Walnut Finish and Red Fabric Upholstered Dining Side Chair"
Hello David, the chairs are not stackable. Thanks for shopping with us!